The final album (recorded before the final album... if that makes any sense). I prefer Let It Be... Naked... But there it is! 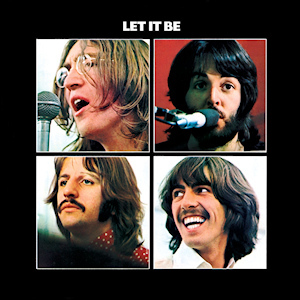 Let It Be topped albums charts in both America and the UK, and the "Let It Be" single and "The Long and Winding Road" also reached number one in the US. Despite its commercial success, according to Beatles Diary author Keith Badman, "reviews [were] not good". NME critic Alan Smith wrote: "If the new Beatles' soundtrack is to be their last then it will stand as a cheapskate epitaph, a cardboard tombstone, a sad and tatty end to a musical fusion which wiped clean and drew again the face of pop." Smith added that the album showed "contempt for the intelligence of today's record-buyer" and that the Beatles had "sold out all the principles for which they ever stood". Reviewing for Rolling Stone, John Mendelsohn was also critical of the album, citing Spector's production embellishments as a weakness: "Musically, boys, you passed the audition. In terms of having the judgment to avoid either over-producing yourselves or casting the fate of your get-back statement to the most notorious of all over-producers, you didn't." However, John Gabree of High Fidelity magazine found the album "not nearly as bad as the movie" and "positively wonderful" relative to the recent solo releases by McCartney and Starr. Gabree admired "Let It Be", "Get Back" and "Two of Us", but derided "Long and Winding Road" and "Across the Universe", the last of which he described as "bloated and self-satisfied – the kind of song we've come to expect from these rich, privileged prototeenagers". While questioning whether the Beatles' split would remain permanent, William Mann of The Times described Let It Be as "Not a breakthrough record, unless for the predominance of informal, unedited live takes; but definitely a record to give lasting pleasure. They aren't having to scrape the barrel yet." In his review for The Sunday Times, Derek Jewell deemed the album to be "a last will and testament, from the blackly funereal packaging to the music itself, which sums up so much of what The Beatles as artists have been – unmatchably brilliant at their best, careless and self-indulgent at their least." In a retrospective review, Richie Unterberger of AllMusic described Let It Be as the "only Beatles album to occasion negative, even hostile reviews", but felt that it was "on the whole underrated". He singles out "some good moments of straight hard rock in 'I've Got a Feeling' and 'Dig a Pony'", and praises "Let It Be", "Get Back", and "the folky 'Two of Us', with John and Paul harmonising together". Despite a mixed review from Rolling Stone at the time of its release, the album was ranked number 86 in the magazine's list of the 500 greatest albums of all time in 2003 but was moved down to number 392 in the 2012 version. VOTE for your LEAST FAVORITE track. First round is easy peasy. Had to think about this for a few minutes: Dig It or Maggie Mae? The first two are easy. across the universe.. sorry guys..
Agree 100%. Phil Spector is overrated producer. "Across The Universe" is definitely the worst song here. John Gabree's right to deride it. John's wimpy lead & the mediocre at best melody. "Across The Universe" is definitely the worst song here. This is why I'm not a betting man. That's right up there with Super Bowl III. 2 B.E. : I explained why it's the worst song. I just could leave it at that instead. But didn't. Explain why Dig It is the better song. "Dig It" is better song as I despise "Across The Universe". I really don't like it, you see, to degree that "Dig It" is good, "Maggie Mae" is good. Dig It, because my name is Maggie. I like hearing them sing about me!! 11 votes spread across 6 tracks! But 5 smilers didn't Dig It. Second round is easy peasy too. Oh dirty Maggie Mae, I hope we vote your track away. Powered by SMF 1.1.21 | SMF © 2015, Simple Machines Page created in 0.101 seconds with 22 queries.